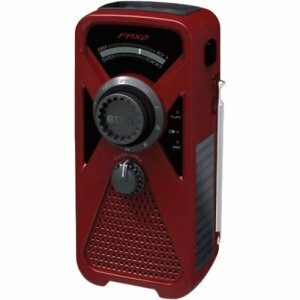 The American Red Cross FRX3 is a solar and hand turbine powered AM, FM, weather radio with alarm clock. There is a built-in USB smart phone charger that allows a 30 second emergency phone call with one minute of cranking. To listen to personal tunes, use the AUX-input to play an external MP3 player. You’ll never be left in the dark thanks to the LED flashlight and glow-in-the-dark locater around the rim of the solar panel. If you have any questions about this product by Eton, contact us by completing and submitting the form below. If you are looking for a specif part number, please include it with your message.